Our family is super busy between school schedules and sports practices, which means I need to have some great snack ideas at the ready. Sometimes this means taking an ingredient and hacking it a little to make a delightful nosh that my family loves. If it were up to them they’d snack on pizza in some form or another every day, but I’ve convinced them to expand their bread-based snack palates to a few more easy-to-make carb hacks that give them just as good of a fix as pizza does. Taking this route is perfect for me since it saves me the time of making something completely from scratch, but I am still able to play with the flavors so I get it just right (plus, if I were stuck eating pizza every day, I’d just about die.) 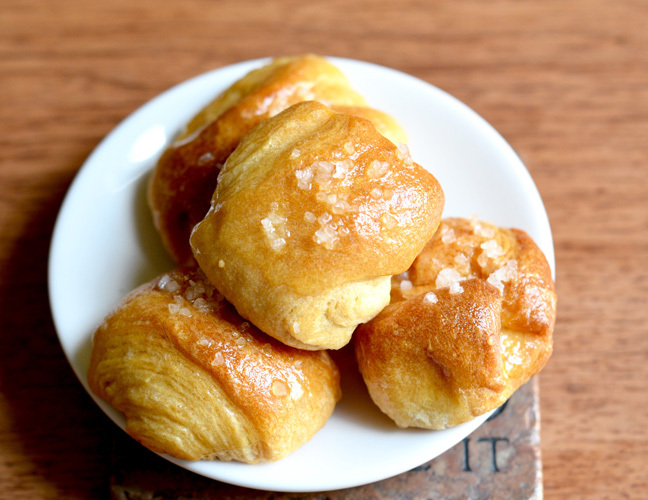 In some cases this means making a cheesy pull-apart bread with a yummy dipping sauce from a few rolls, and other times it means whipping up salty pretzel bites or sugary donut holes with some bread dough. No matter what, these tasty treats come together quickly and beautifully and are perfect for those moments after practice where my kids are positively ravenous and looking for a warm, quick bite to eat. Step 1: Preheat the oven to 350 degrees F. Line a cookie sheet with aluminum foil and spray lightly with cooking oil. Step 2: Use a serrated knife to cut a grid pattern in the top of each roll. Don’t let the cuts go all the way through the bottom. Place the rolls on the foil. Step 3: Add the cheese and taco seasoning to a zipper storage bag and toss well to mix. Divide the cheese evenly among all the rolls, pressing it down between the squares on the top of the bread. Lightly sprinkle cheese on top. Step 4: Cover the rolls with aluminum foil and bake for 15 minutes. Then remove the foil and bake for 5 more minutes, or until the top of the bread is toasted and the cheese is melted. Step 5: Remove the bread from the oven and allow it to cool slightly. 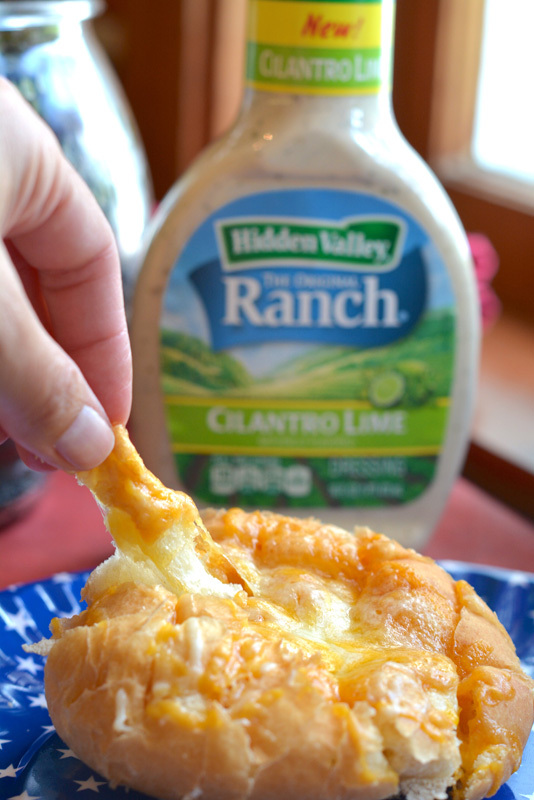 Step 6: Transfer it to a plate and serve with Hidden Valley Cilantro Lime Ranch Dressing for dipping. Rolls should tear apart easily. Step 1: Preheat the oven to 350 degrees F. Line a baking sheet with parchment paper. Mix the sugar and cinnamon together in a bowl and set aside. Step 2: Cut the bread dough into 12 even-sized pieces. Make a pocket in each dough ball and tuck a chocolate square into the middle of each one. Pinch the roll shut completely and face seam side down on the baking sheet. Bake for 15 to 20 minutes, or until the rolls are completely cooked through and lightly browned on top. Step 3: While the rolls are cooling, melt the butter and brush the warm butter over the rolls. 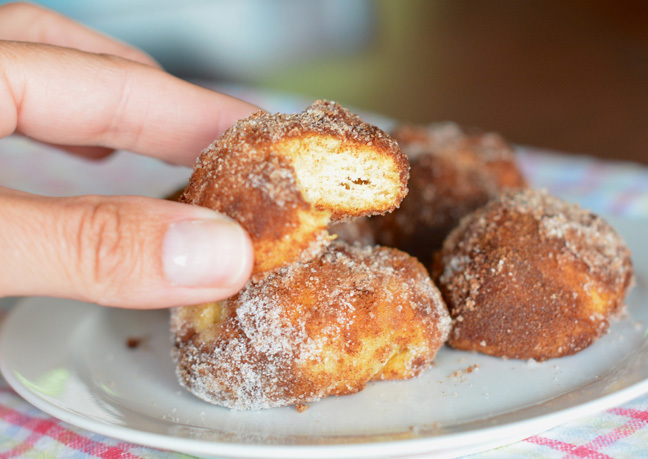 Roll them in the bowl of cinnamon sugar and enjoy! Step 1: Preheat the oven to 375 degrees F and line a baking sheet with parchment paper. Step 2: Bring a large pot of water to a boil. Step 3: Cut the bread dough into 12 even-sized pieces. Use a slotted spoon or similar tool to lower the bread dough into the boiling water. Boil the bread for about 1 minute, making sure the pieces are boiled on all sides. Step 4: Transfer the bites to a paper towel to drain completely. Step 5: Place the bites on the lined baking sheet and bake for 20 to 22 minutes, or until golden brown and puffed up. Remove them to a cooling rack. Step 6: Brush the rolls with melted butter and sprinkle with the salt. Enjoy!